Grapefruit (Citrus paradisi) was first described in the 18th century as “the forbidden fruit.” It is a hybrid between an orange and a pomelo (Citrus grandis). Sweetie oil is a type of grapefruit oil, produced from a grapefruit and pomelo hybrid. Grapefruit belongs to the Rutaceae plant family. It is a large evergreen fruit tree that originates from Jamaica. It can grow up to 9m tall and can produce around 500 fruits per year. Most of the world’s grapefruits are produced in USA, particularly in California, Florida, Texas and Arizona. They are also cultivated in Tropical Asia and West Indies. The sweetie variety is mostly cultivated in Israel. It was produced to be much sweeter than traditional grapefruit, hence the name. It is also sometimes referred to as oroblanco. Aromatherapists use grapefruit oil as a refreshing and tonic fragrance; it reminds us of the sun’s energy and can help perk up a dull morning. It’s popular for lifting the mood and has been used extensively to treat stress, depression and even Seasonal Affective Disorder (S.A.D. ), which can strike during dark winter months. Sweetie fruits are large, round and bright green. They have a thicker rind than that of the grapefruit. The oil is extracted from the peel by cold expression and it is pale yellow with a sweet citrus aroma. 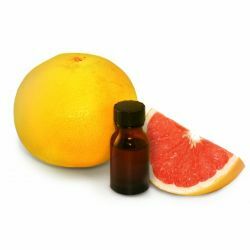 Grapefruit oil is used by aromatherapists as antiseptic, astringent and antibacterial oil for conditions such as acne and congested, oily skin. Sweetie oil is a fairly new product, but it is used interchangeably with grapefruit oil. Grapefruit and sweetie oils are also popular as top notes in fine fragrances. We use sweetie oil in our product perfumes and fine fragrances. We’ve added it to the retro World Piece Bath Ballistic.